Drizzle olive oil and sprinkle salt over kale. Lightly grill both sides of kale leaves. Cut out kale stem from leaves and chop. Mix chopped kale, Greek yogurt, minced garlic, Meyer lemon juice, whole grain mustard and Parmesan shavings in bowl, saving a few shavings for garnish. Add salt and pepper to taste. 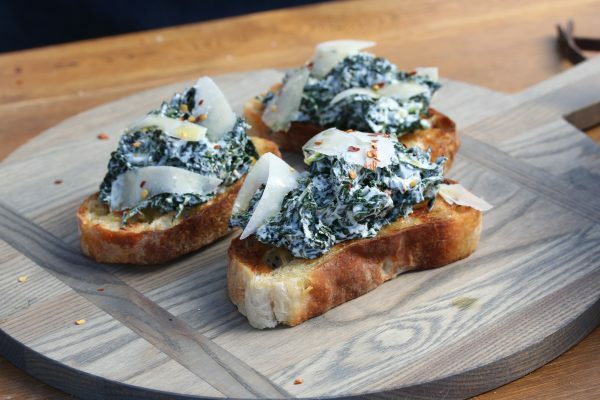 Toast sourdough bread slices and top with kale spread. Garnish toast with Parmesan shavings.